Spartans FC Walking Football went to the Mallorca Walking Football Tournament in sunny Santa Ponsa in May this year. We had a wee setback in that three of our team couldn't make it but we managed to convince three players from our pals over at Broxburn FC to join us. This meant that we had the minimum squad for the 6 a-side competition! Then disaster struck at the last minute when one of the Broxburn players had to drop out. We notified the organisers and they agreed we could "borrow" a player or two at the tournament. Flights and accommodation booked and off we went. We scouted the holiday makers for any "more mature" looking folk to recruit to the squad and found Michael, an Irish lad of 74. So now we were a squad of English, Irish and Scottish - no joke! We also recruited Robin who was on holiday from East Kilbride celebrating his 60th birthday. After a bit of banter about Spartans FC pipping East Kilbride FC to the Lowland League Championship, we arranged to meet up at the pitches the next day for a quick training session and competition briefing. Our new team members Michael and Robin hadn't played Walking Football before and Michael hadn't kicked a ball in over 20 years. It just goes to show that walking football is for all! We got an early night and gathered for our first and only team training session. It was sweltering as we went through our paces and went over the rules. We made sure to re-hydrate and then allowed ourselves a (small) beer, after all, team building is important! We all got kitted up in our Sky Blue Spartans kit. and got our photos taken. There were two sections in the tournament: over 55's and over 60's. Two of our squad were 55, the rest of the squad were over 60, which put us in the over 55's section. This was our first lesson learnt. We were the only team in our section with players eligible to play in both sections. Next time we go, we need to send two teams - one for each section. Our first match was on Sunday morning. We managed a respectable 2-2 draw. The match on Sunday took it's toll and as the sun shone brighter and we sadly didn't! The more we played the tireder and more sunburnt we got (second lesson: more sunscreen!) 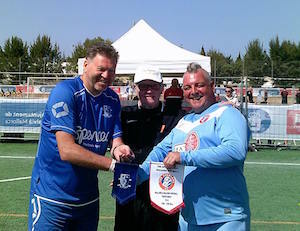 Our 3rd match was against Hallam FC, who were captained by ex-England International Chris Waddle. They beat us 2-0 but it wasn't that bad because Hallam went on to win the tournament. On day 2 we got knocked out in the quarter-finals and our competition was over. The evening meal was at Paco's restaurant and we reflected on our performances, missed chances and the good fun we all had. We all vowed to return next year and do it all again. Until next season Viva Espana!